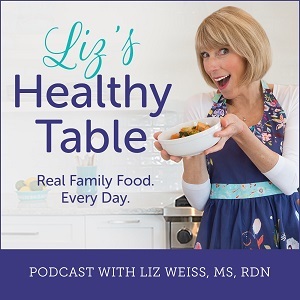 In this post, I hear from Sally Kuzemchak, MS, RD from Real Mom Nutrition about healthy snacking for kids and her new e-book, The Snacktivist’s Handbook. Read on for Sally’s guest post. I’ve got nothing against snacks. Kids love them. MY kids love them. And frankly, I wouldn’t be able to get through the day without a snack or two either! They’re an excellent way to get more good nutrition between meals. But the reality is that kids today are snacking more than ever before—and on the wrong stuff. Research tells us that chips, cookies, crackers, sugary drinks, and other highly-processed foods are among the most common snacks for children. And no wonder: These kinds of munchies are regularly doled out in youth sports, in school, at camp, at church, and so many other places where kids gather. Seems like kids can’t do anything these days without getting a packaged snack to go along with it. Several years ago, I started a campaign on my blog Real Mom Nutrition called Snacktivism. It’s a grassroots effort to improve the culture of snacking for kids. It’s about rethinking snacks, about finding a choice that’s good for our kids’ health and habits. It’s not about banishing cupcakes and cookies—it’s about putting them back to where they belong as special occasion foods. I created resources for parents to work in their own communities, so they could have conversations with teachers, coaches, and preschool directors and come up with solutions together. I just compiled those resources, plus a whole bunch more, in a new e-book called The Snacktivist’s Handbook. In Team Sports: If you’re fed up with cookies, chips, and sugary drinks on the sidelines of sports, my number-one tip is to talk to the coach BEFORE the start of the season. 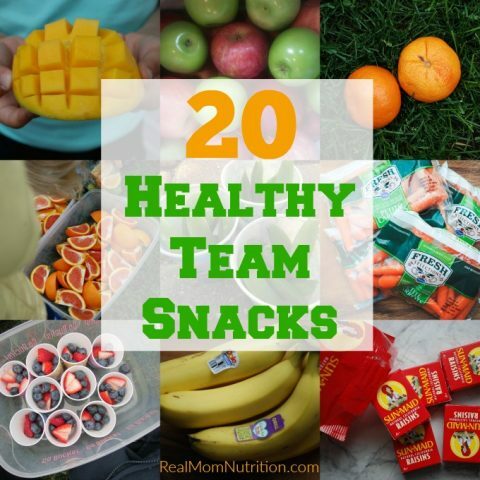 Express your concerns politely and ask if the coach would support either switching to fruit as a team snack or eliminating team snacks entirely. In my experience, when an idea comes with the coach’s support, parents are much more likely to be on board too. In the e-book, I provide an email template you can customize and send to the coach and team parents. You can download a free printable list of 25 fruit and veggie team snacks on my blog. At School: Birthday treats are a nice idea in theory but can quickly add up to tons of extra sugar for kids. I’ve even heard of schools celebrating HALF-birthdays with treats! If your child’s classroom is suffering from cupcake-overload, go to the teacher with ideas for alternatives, such as parents providing a craft instead of cupcakes or bringing a book to read. Or volunteer to help stock a “birthday prize box”. 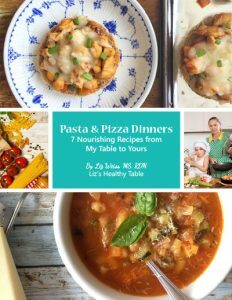 The e-book includes printable lists of food-free birthday celebration ideas, food-free classroom rewards, and healthier school fundraisers. At Camp: Remember that many other parents likely feel the same way you do about junk food at camp, but very few speak up. So when you’re shopping around for camps, ask about food policies. Find out if snacks are given (and if so, what they are) and whether food is given out as rewards. Let the camp director and staff know that this is something that matters to you. Camps want to fill spots and truly care about what’s important to parents. You can read about my own experience with a local camp—it’s proof that positive change can be set into motion by just a few parents! At Home: For some reason, the word “snack” has become synonymous with “treat”. My top tip is that most snacks should look like foods you’d serve at mealtime. That means fewer packaged foods with lots of additives and added sugar and sodium and more snacks made up of whole, largely unprocessed foods. 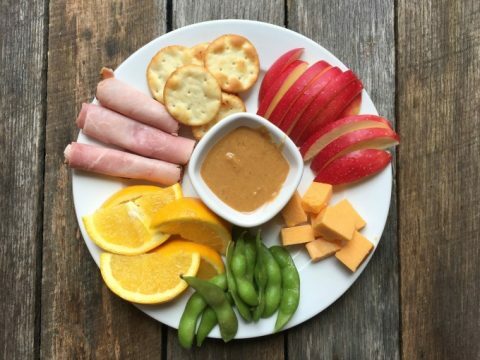 Some of my favorites are smoothies made with milk and frozen fruit, cheese and whole grain crackers, and these easy Snack Platters that my kids devour. Whatever you do, please know that one parent really CAN make a difference—and I would love to help you! Sally Kuzemchak, MS, RD, is a registered dietitian, educator, and mom of two who blogs at Real Mom Nutrition. 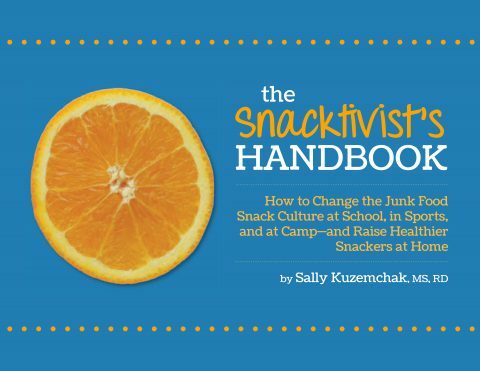 She is the author of The Snacktivist’s Handbook: How to Change the Junk Food Snack Culture at School, in Sports, and at Camp—and Raise Healthier Snackers at Home. You can follow her on Facebook, Twitter, Pinterest, and Instagram. 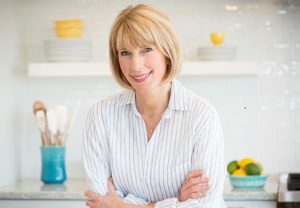 She collaborated with Cooking Light on Dinnertime Survival Guide, a cookbook for busy families. In her spare time, she loads and unloads the dishwasher. Then loads it again. We have had the veggie only before dinner rule for years. When my girls were little I would cut a bell pepper like I needed it for dinner. They would “sneak” into the kitchen to snitch a piece and gobble it up. It was a great way to encourage vegetables and avoid other snacks. Now that they are bigger they have given up any attempt at sneakiness. I, in turn, do not pretend that the veggies are cut for any other reason than snacking! I would love to win the new Ebola because I need easy quick snack ideas to serve my kids after they come from school! Ebook not Ebola ! LOL auto correct! To every friends/family gathering, I try to bring a fruit or veggie option instead of standard chips/crackers, to encourage the kids to make healthier choices. Seriously snacks kill me everyday. I have 5 kids and they devour everything so fast. It makes me sick finding piles of fruit snack packages hidden in couches or under beds. I love the idea of making them look more like a regular meal. I would love this book to help me reach that goal! If my kids ask for snacks while they watch TV, I tell them they can only have raw carrots. They’ve come to accept and enjoy that rule. I’d love more ideas! I always prepare healthy and homemade snacks and try to tell kids how much better homemade is! I also will cut fruit and veggies into fun shapes (stars, butterflies, etc.) to make it more fun. I would love to see Sally’s additional ideas. This is a great post! It is for sure an issue that needs to be addressed and you have some great ideas. Now that my daughter is in high school she comes and goes and comes and goes. I like to have healthy snacks around even when I’m not that are easy to grab and go. I always forgo sugary sports drinks by filling my boys’ water bottles before sporting events. To make sure they have enough, I fill another container so they can refill as needed. Bringing a cooler with cold fruit also helps them feel like they are getting a treat between games. 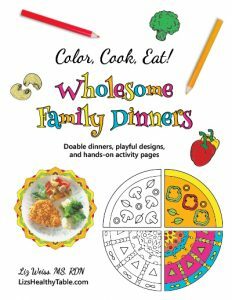 Looks like a great resource for families! Can’t wait to check it out! My toddler has a peanut allergy, so I have to be super careful about snacks. This has made me into a big anacktivist just to keep my little guy safe! I want the book so I can become a snacktivist not only at home, but also at work! I always take fruit fir team snacks! I know we all live snacks. Oreos. Ice cream with all the toppings. Pizza rolls. But it’s amazing how much they’re just plain old nicer to each other when they have had limited sugar. They don’t get agaitated as much. They study better. They play together well. Anyway, I would love the free e-book. Thanks for having the contest.